Ghandi may be a beloved peace activist, but he's no pushover when it comes to empty threats. The Civilization games have always been my favorite series. The granddaddy of all turn based strategy games, the original Civilization, is still rated as one of the most innovative games created for the PC. Needless to say my expectations were very high for Sid Meiers newest offering, Civilization 3. Fortunately, I wasnt disappointed. Both rabid Civilization fans and newbies will rejoice at the revamped controls in Civ 3. Gone are the hated (at least for me) long treks made by diplomats and caravans to reach their destinations. In fact, both trade and diplomacy are more important than ever. While trade was purely optional in previous games, Sid has made it a necessity for any hopeful leader with the introduction of strategic resources. Found out the secret to gunpowder? Great. But before you can start churning out musketeers, youd better have some access to saltpeter. Best of all, you can trade with any civilization that has a road connecting between your two cities. This new twist makes city placement and diplomacy even more crucial than before. You can withhold important resources for yourself, or use them as diplomatic clubs to make your hapless neighbors do your bidding. 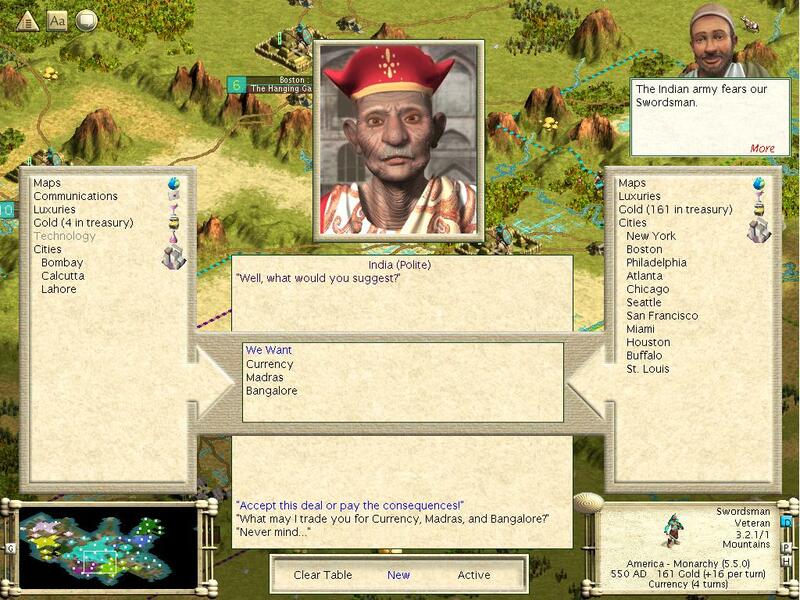 Speaking of diplomacy, Civilization 3 offers more detailed diplomacy options than its predecessors. You can now embargo countries you dont like, or extort a favorable (for you) trade agreement from your ally in exchange for a military alliance. Another new feature in Civilization 3 is the importance of culture. In previous games in the series, the civilization you chose has virtually no impact on the game. Now, every civilization has their own unique specialty unit. This adds an important element of strategy in which civilization you choose. The Aztec Jaguar is an improved Warrior unit, which means the Aztecs have an early game advantage over other civs. Meanwhile, the Americans have the F-16, a precision strike fighter that gives the Americans an edge late in the game. Depending on how aggressive you are in your style of play, some civilizations will fit your playing style better than others. As a general rule, I find that usually civ that peaks in mid game, such as the French, is a good choice for beginning players. Civ 3 also introduces the concept of national borders, which in my opinion is long overdue. The more improvements you build in a city, the more culture points it accumulates. When it reaches a certain amount, your city will level up and expand its borders. I'm sure anyone who played Civ 1 or 2 remembers having to colonize the whole freakin continent just to avoid barbarian hotspots. Having borders that extend beyond your city radius also helps to block the occasional foreign city the AI used to plant in the middle of your country. If your civilization has accumulated enough culture points, foreign cities next to your civ will switch over to your side, giving culture both offensive and defensive uses. The creators of Civilization 3 played it safe when designing the game; veterans of the series won't find any surprises here. Depending on how much you liked Civilization 1 and 2, this may or may not be a good thing. Although aside from the graphics facelift and some minor issues, the basic concept and layout of the game remain unchanged. I believe this is a testament to both the genius and ingenuity that has gone into the game as a whole, and the fact that the Civilization series simply has nowhere else to go. I'm positive Civilization 3 will enjoy the same longevity as its predecessors through its scenario feature and robust game editor. So lets all rejoice in this newest rendition of our classic game, and hope Sid Meier will not let the good name of Civilization get run into the ground like so many other series before it.